House conservatives and outside experts doubt HHS Secretary Tom Price has legal authority to substantially revise the Affordable Care Act's key insurance market regulations and other provisions by issuing new rules and guidance. If they are right, that would pose problems for the strategy of the Trump administration and House Republican leaders to rely on administrative action to reform the ACA, strengthen the individual insurance market, and keep premiums down. On Monday, HHS launched a new website to track regulatory changes the Trump administration is making to repeal and replace the ACA. In addition to issuing new rules, Price is expected to review old ones and rescind those he believes are counterproductive. Price's efforts are part of a three-part plan laid out by House Speaker Rep. Paul Ryan to repeal and replace the ACA. Those include congressional passage of the American Health Care Act, new HHS rules, and additional legislation that would be passed through regular congressional order requiring Democratic support in the Senate. One such bill would be to allow insurers to sell plans across state lines. But members of the ultra-conservative House Freedom Caucus, made up of around 40 House Republicans, are criticizing the concept of the executive branch essentially overturning parts of the ACA. Rep. Raúl Labrador (R-Idaho), a member of the Freedom Caucus, said last week that Price will not be able to finalize rules that are not in compliance with the ACA. 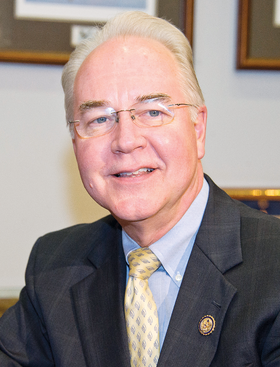 Experts say Price could issue some rules that may be able to withstand legal challenge. But it would take months, not weeks, to do so. That's because he would have to go through the standard, time-consuming process of publishing a draft rule and receiving public comment before anything was finalized. And healthcare industry and pro-ACA advocacy groups may sue to block the proposed rules. “It's going to be really difficult for him to wave his wand and revoke anything,” said John Williams, an attorney at Hall Render Killian Heath & Lyman, P.C. and former Republican congressional staffer. Some rules Price may try to issue include ending the ACA's contraceptive coverage mandate and making all value-based payment models developed by the CMS Innovation Center voluntary, Williams said. Price could also withdraw the rule released last year that overhauled regulation of Medicaid managed care programs, said John Gorman, a former CMS official who heads the consulting firm Gorman Health Group. That mega-regulation “gets in the way of the GOP's plan to turn Medicaid into a per-capita cap system by setting a national set of minimum policies that health plans must meet,” Gorman said. If Price tries to rescind that rule, network adequacy provisions, a medical loss ratio mandate for managed care plans, and managed long-term services and supports policies would all be eliminated. The 10 minimum essential health benefits for private health plans could be another target for Price, who has some authority to redefine those benefits, said Emily Evans, a health policy analyst at Hedgeye Risk Management.